The season pass will include 4 upcoming DLC map packs, the "Team Leader Pack" and other exclusive digital content, also regardless of which version of the game you purchase your online rank and unlocks will be cross generation, this means players on Xbox 360 can also level up on the Xbox One and Playstation 3 players can do the same with the Playstation 4. If you don't have $200 to dish out, then the cheaper $119.99 edition (which includes all above except the camera) and regular editions will be on sale at launch respectively. So, which edition will you be purchasing? 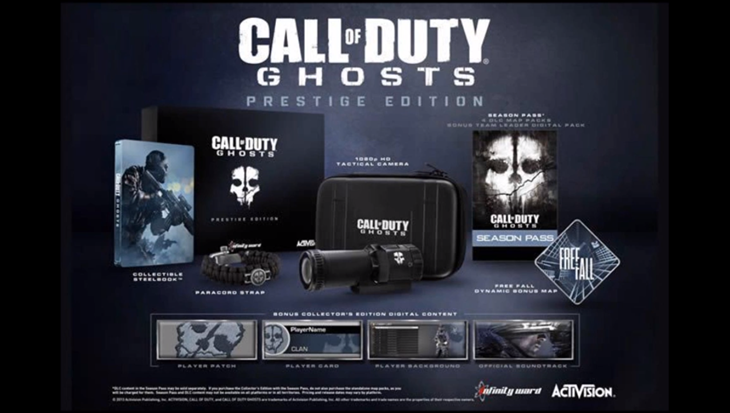 Do you have the money to splash out on the Prestige Edition, or will you be sticking with the Standard edition? Let us know in the comments below. You can also check out Jake and Amir from CollegeHumor demonstrate how someone can put the helmet cam to good use.